A poster for the 2018 Sokei Regatta. It can be displayed either way up, depending on your loyalty. Picture: @wkregatta. 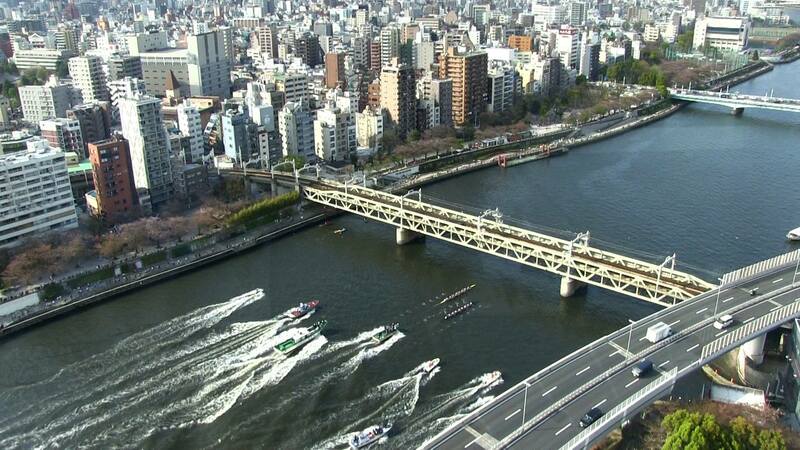 Tim Koch discovers a boat race that is Big In Japan. Sokei Regatta seems to be counted as one of the three biggest regattas of the world along with Oxford vs. Cambridge and Harvard vs. Yale with the history more than 100 years. This is a big claim – which I reproduce without comment. 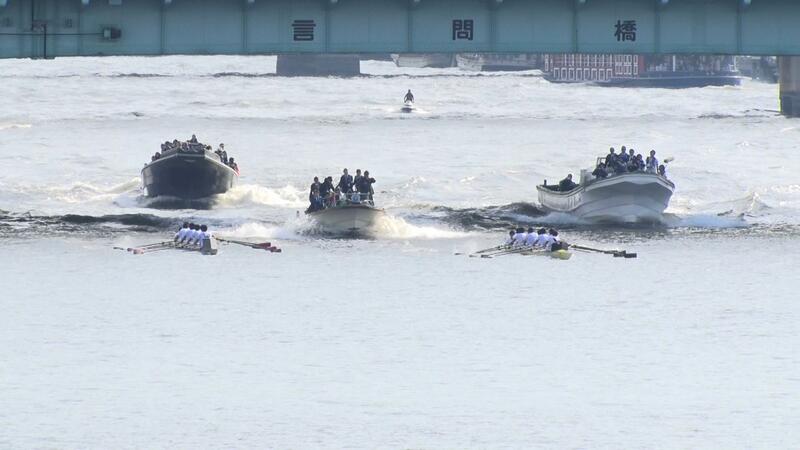 However, whatever its validity, the Sokei Regatta (also called the Waseda-Keio Regatta or W-K Regatta) is an event worth looking at in more detail. The official website is (not unreasonably) in Japanese but is still worth a visit by non-Japanese speaking Gaijin to wonder at the artwork. 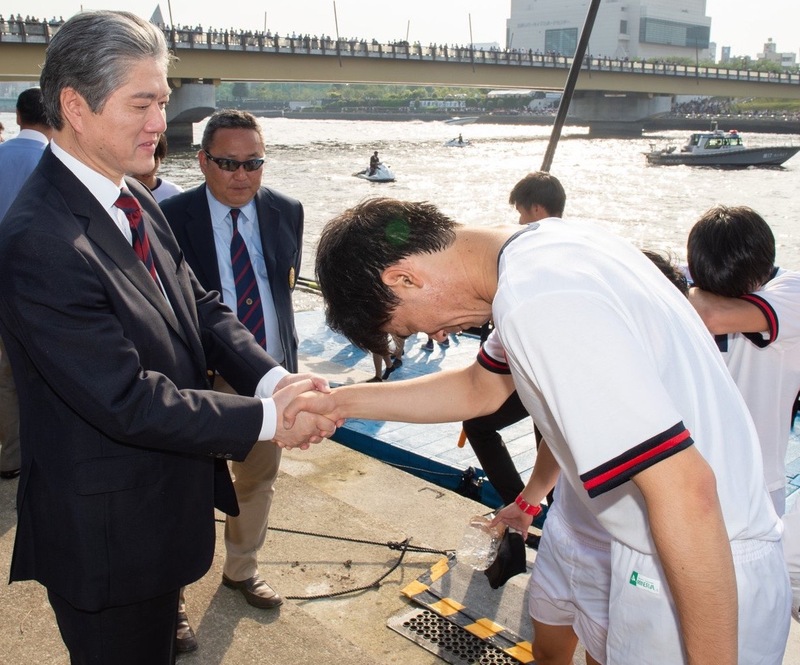 The Waseda-Keio Regatta is held every April on the Sumida River in the heart of Tokyo near the Asakusa district, a well-known tourist area of the Japanese capital. Pictures: @wkregatta. The teams were neck-and-neck when Keio sent Shigeru Mizuhara to field.… Waseda went wild with fury, as earlier in the match Mizuhara had repeatedly — and often successfully — challenged the umpire’s calls. As Mizuhara took his position, the Waseda crowd began throwing garbage at him. Mizuhara tossed the trash aside — all save a half-eaten apple, which he threw right back at the Waseda supporters. This angered the fans, and when Keio’s two-run home run swept his team to victory shortly after, they poured onto the field in fury. This so-called ‘Apple Incident’…. escalated into a riot of 6,000 angry fans that took 200 police officers to quell. Though not as well-known abroad as the rivalry between Oxford and Cambridge, or Harvard and Yale, that between Keio (founded in 1858) and Waseda (1882) has been raging for almost a century…. The most heated So-Kei (or Kei-So, as Keio students call it) rivalry is in baseball, but there are matches for almost every sport, including rugby, rowing, American football and soccer. Though competitive rowing may not be particularly popular in Japan, it is a major sport in Europe and the United States… Keio (University) Rowing Club was established in 1889. In 1905, the club started competing against Waseda University in the Waseda-Keio Regatta… A popular and historic event, this regatta has regularly attracted more than 30,000 spectators in the 85 meets held to date. Currently, Keio Rowing Club boasts around 80 members. 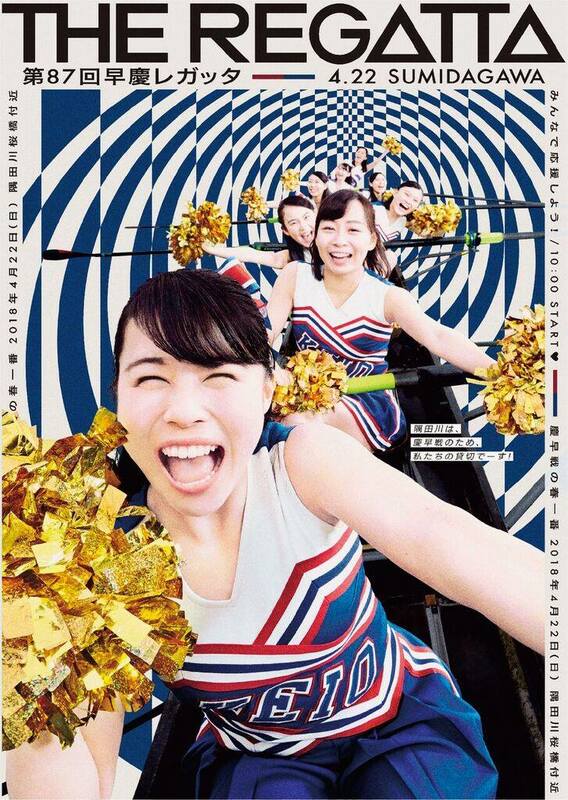 The Japanese may not be world beaters at rowing, but their graphics are pretty good. 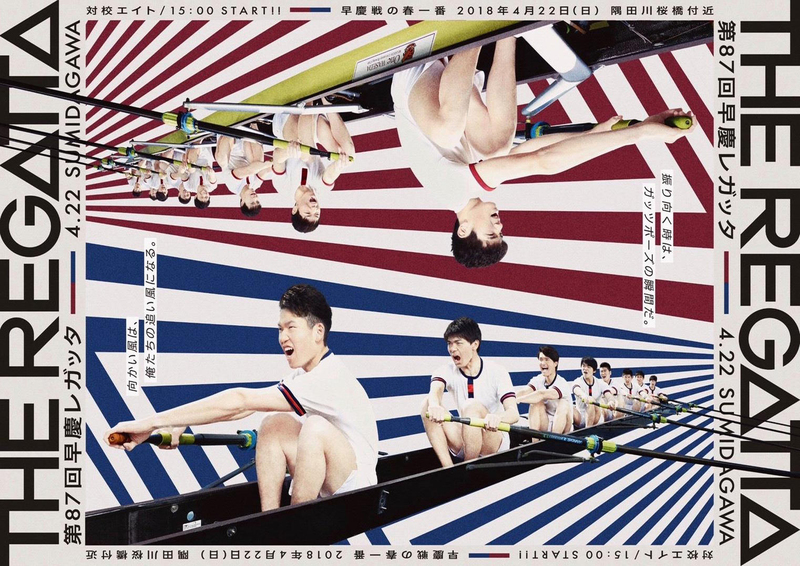 This is a poster for the 2017 Regatta featuring Waseda. Picture: @wkregatta. More promotional artwork, this showing Keio. Picture: @wkregatta. 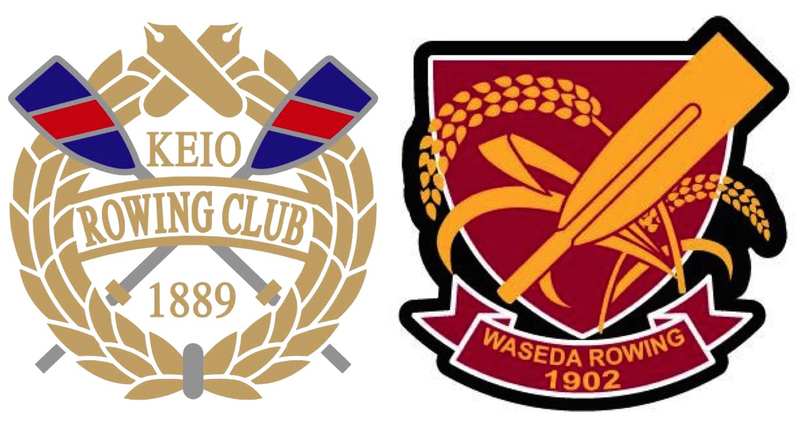 Founded in 1902, the Waseda University Rowing Club (WURC) is part of a long tradition of rowing in Japan. 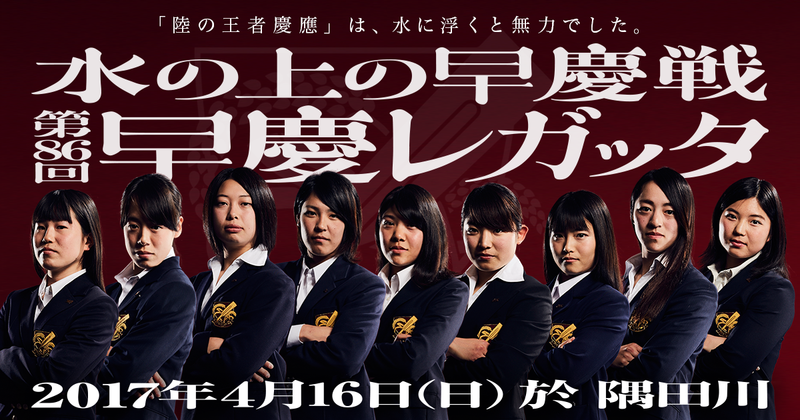 It hosts one of the country’s older university rowing teams which was one of the first sports clubs at Waseda. Despite its deep-rooted traditions in a culture that prides itself on honouring the past, the WURC has also looked to the future, opening up the sport to women in 1955. 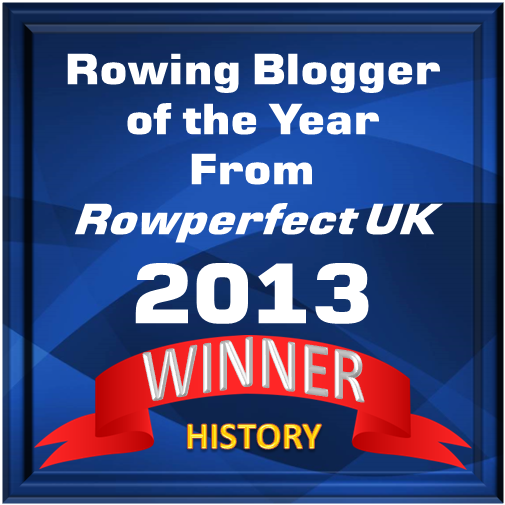 A women’s race with rival Keio followed the next year, a pioneering achievement for women’s rowing in Japan. The current team numbers 22 female and 48 male students participating as rowers, coxswains or support staff. The Waseda Women’s Eight, 2017. Picture: @wkregatta. Supporters of Waseda at the finish by the Sakura Bridge. A few metres away, Keio fans are doing much the same thing. Picture: @WasedaU. These Keio supporters are happy – but this was before the 2018 results had come in. Picture: @wkregatta. The men’s eights first raced each other in 1905 on the Sumida River. 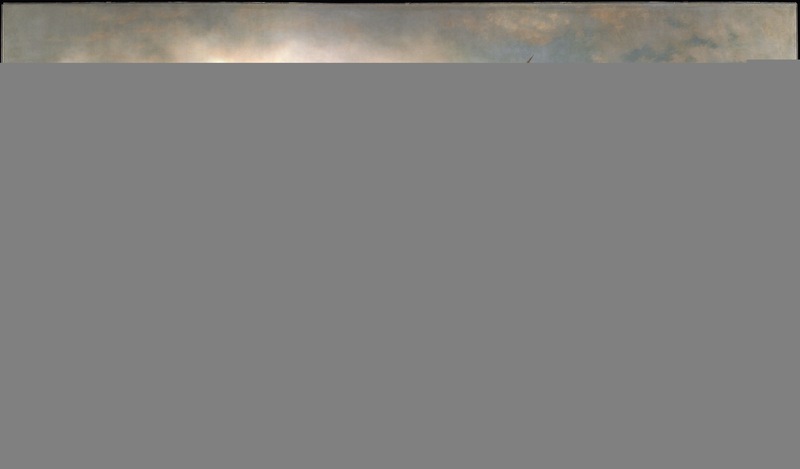 To date, 87 regattas have been held with only 17 cancelled in 113 years (notably during and after the Second World War). 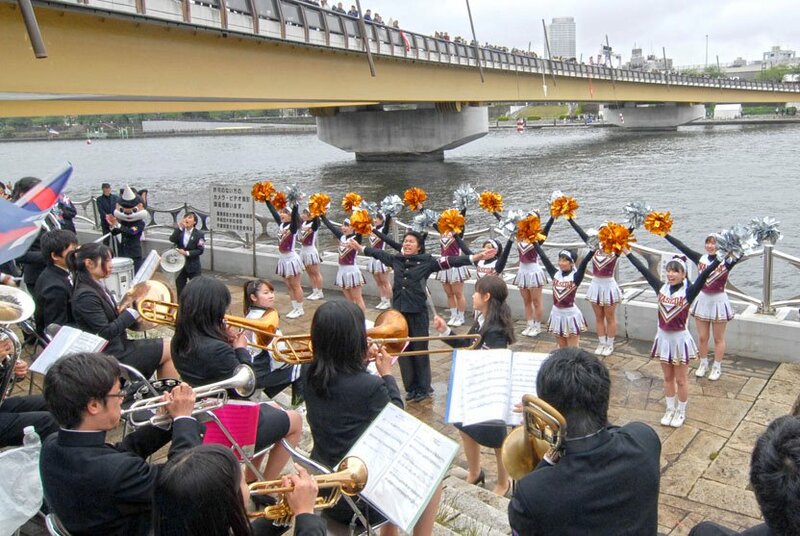 The event had to be relocated for a long time due to river pollution, but it was brought back to central Tokyo in 1978. In previous years, the Regatta has successfully invited some high-profile visiting crews including ones from the universities of Oxford, Cambridge, Sydney and Melbourne. In the 2018 Regatta, the women’s premier eights raced over 1,000 metres and Waseda had their third win in three years with a time of 3 minutes 48 seconds, nine seconds faster than their rivals from Keio. 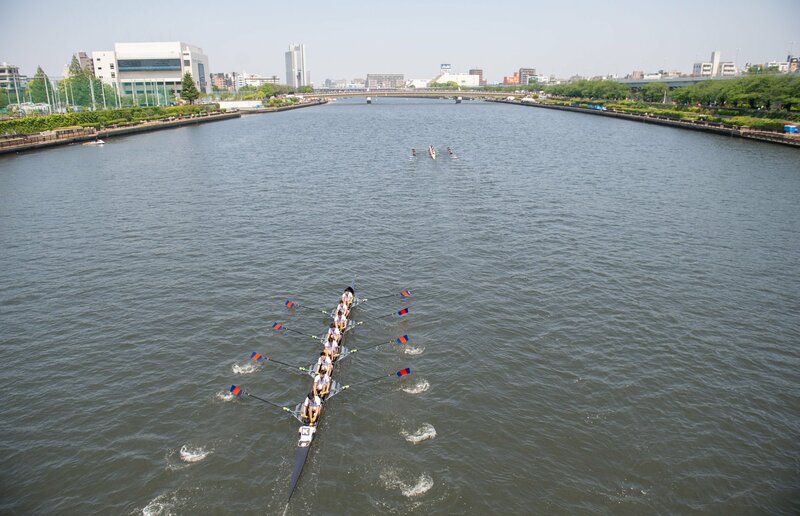 The top men’s eights raced over a distance of 3,750 metres with Waseda again victorious in a time of 12 minutes 30 seconds, five seconds ahead of Keio, making it their second win in two years (the Keio men had won for five years in a row before that). The full 2018 regatta results are on FISA’s worldrowing website. 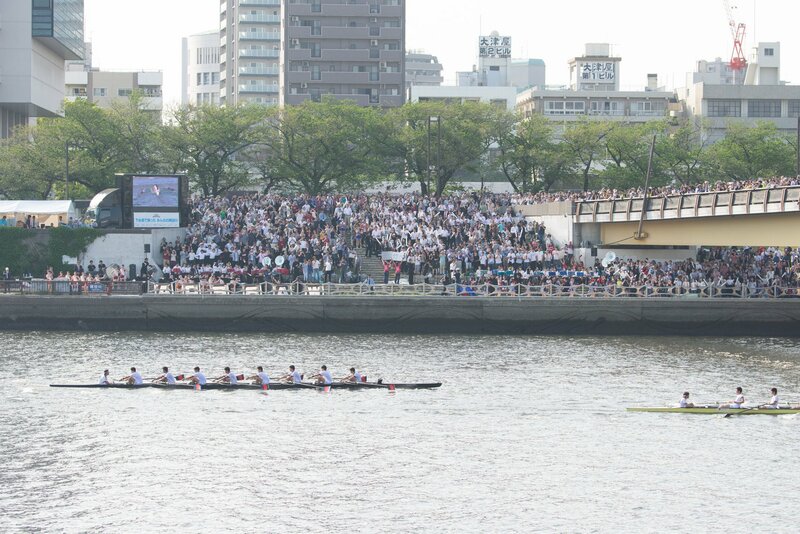 The 2018 Regatta, probably the Men’s 2nd Eight Race, won by Waseda with an 18-second lead. Picture: @keioglobal. Weseda win the 2018 Men’s Race. Picture: @keioglobal. Keio, suffering defeat as perhaps only the Japanese can. Picture: @keioglobal. Racing is close to the site of the 2020 Olympic rowing course in Tokyo harbour, a place where we will see some better-publicised rowing in slightly less than 600 days’ time. Fantastic article – I had no idea!